In the last few years, sociopolitical events have been marked by the presence of hashtags on social networks, creating a direct dialogue with street protests. This chapter aims to investigate how media activism movements appropriate hashtags to expand the narrative through social engagement. In this sense, hashtags appear as signic processes that perform a mediating function. They articulate common positioning that creates hybrid and transmedia storytelling using online and offline dynamics. 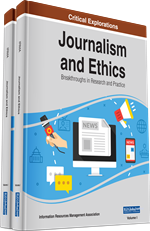 From the theoretical-methodological support of semiotics by Charles Sanders Peirce and the principles of transmedia, this study analyzes the news production by the Brazilian media activism group Mídia Ninja [Ninja Media]. The results point to a transmedia journalism anchored to the social use of hashtags by the association of new signs to semiosis, generating provisional action habits from collateral experience. In the communication processes related to the convergence culture (Jenkins, 2006), located in the connection between the transmissive dynamics of the mass media and the associative dynamics of social networks (Castells, 2012), it is possible to perceive an accumulation of records that leave various traces. With the increase in access to mobile devices, the production and sharing of contents have become a common practice by individuals. Sociopolitical events, which once gained visibility only through the traditional media agenda, are now also recorded and mainly disseminated by ordinary citizens. Records are organized in large files in programmable environments, under the influence of algorithms that design the network dynamics. This means a decentralization of communication tools, raising a controversial debate about journalistic practices. This new media ecosystem (Canavilhas, 2014; Scolari, 2013), which incorporates collaborative production, has offered visibility to manifestations and protests around the world (Castells, 2012). Although they are born in the streets, they find a fertile and promising soil for the expansion of the stories on the Internet, shaping an organic network of content production. There is an occupation of the public space that gains notoriety and legitimacy through the shared narratives on social networks. This scenario is also marked by the distrust of corporate media, which leads to the strengthening of the free media format. After the appropriation of cyberspace by movements that began in the Arab world and then expanded through Iceland, Spain and the United States, it is possible to notice the emergence of sociopolitically organized groups that seek the apparent democratization of information, instigating the participation of the common citizen in the processes of verification, selection and production of news (Bentes, 2015). This propagation of sociopolitical events has used hashtags to gain engagement in social networks. It favors the emergence of a new media agenda, which passes through the Trending Topics of the digital platforms, showing the relevance of certain subjects from the volume generated by the conversation on the network within a short period of time (Groshek & Groshek, 2013). However, although hashtags were created to group and monitor content on the Internet, with Twitter as their primary platform, they have played a major role in setting boundaries in common positioning inside and outside the digital environment. Their function extrapolates the physical condition of their trail to become an important agent in the production of meaning. Thus, in this work, hashtags are understood as signic processes that fulfill a mediating function in the creation of new meanings. For Peirce (CP 2.308), the notion of mediation is tied to the idea of semiosis, containing three elements: Sign (representamen), object and interpretant. Semiosis is a reticular process involving the determination of a preceding sign (object) and the representation of a posterior sign (interpretant). What mediates the object and the interpretant is the sign (representamen) in order to produce another triad sign and so forth. The interpretant is the formation of a new sign that guarantees the vitality of semiosis. This happens in the hashtags case because, in social networks, they are initially linked by the sociotechnical action of their index trail. In addition, through repetition and intermedia behavior (Müller, 2010) and by expanding content across multiplatforms, they also assume a normative function that indicates the construction of the thought. The same happens when hashtags are used on T-shirts and posters in street protests. Hashtags become signs that seek the determination and representation of an object (Alzamora & Andrade, 2016), which turns to be a complex semiosis (signification) process with infinite possibilities. For this reason, hashtags are used repeatedly in news production by media activism groups, as a feature that points to transmedia storytelling (Jenkins, 2006; Scolari, 2013).